Official plan for the day: Weather permitting, your guide will take interested hikers on a scenic walk through a Cappadocia valley. Non-hikers can spend the morning in Mustafapaşa, or ride with our bus driver to the colorful weekly market in the nearby village of Ürgüp. After lunch, we’ll tour the ancient underground city of Kaymaklı — which once included churches, kitchens, metal shops and stables — before returning to our village for an evening on your own. At 05:15 am the guides head down to the bus, leaving our warm beds behind us. 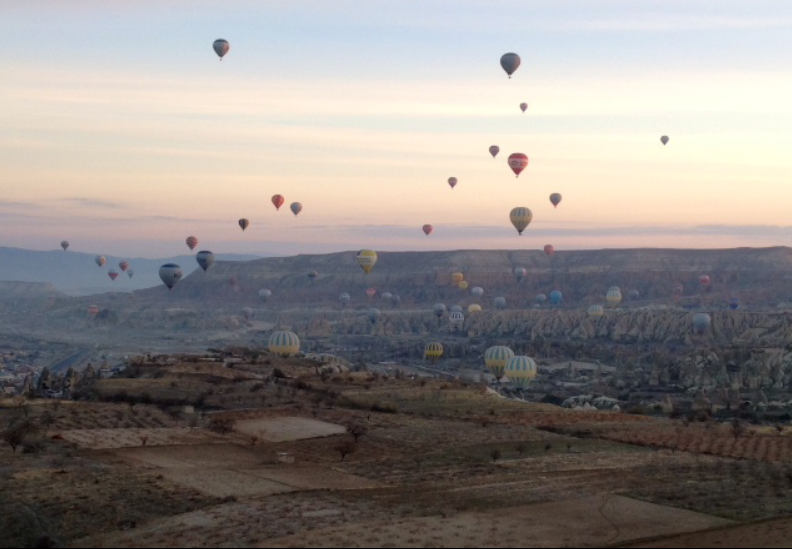 We Rick Steves guides have all been looking forward to our time in Cappadocia, but this day is special. It’s a frosty dark morning and there is a sense of expectation filling the bus as we drive up into the hills. The sun has begun to light up the horizon. 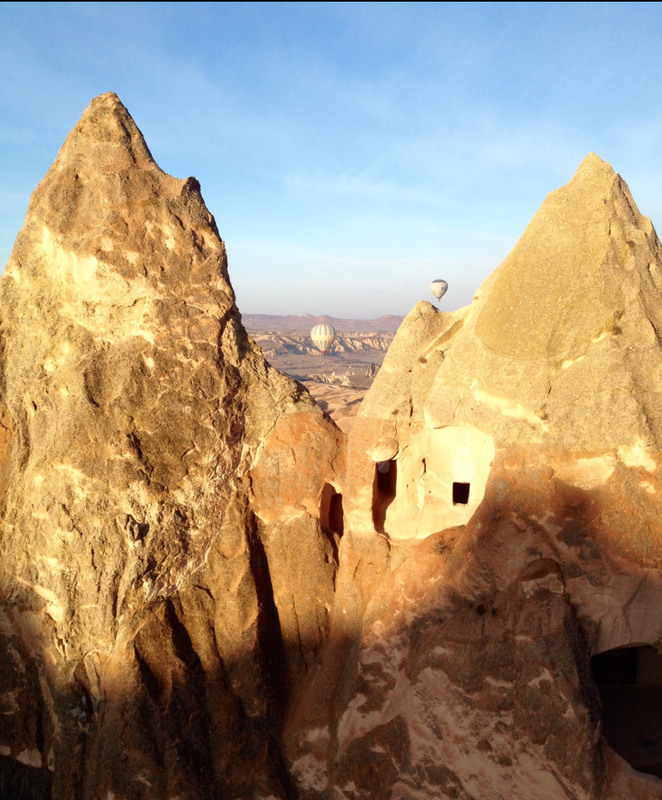 We have all finished a light breakfast and driven further up onto the plateaus of Central Turkey. Our miniature convoy of 3 minibuses turn a corner… And there they are, all lined up and partially inflated. We have arrived at our destination and the guides are filled with awe at the beautiful sight of 3 hot air balloons slowly falling the dawn sky as they await their cargo of passengers. 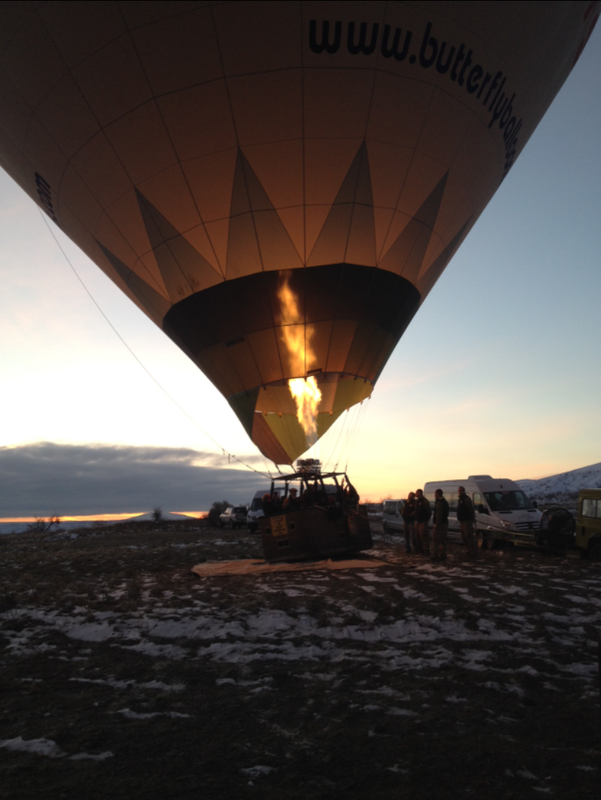 We are hurried from the minibuses over to our allotted balloons and stand back in admiration at the spectacular age of the gas burners lighting up the dawn. The moment arrives and we all climb into our basket. 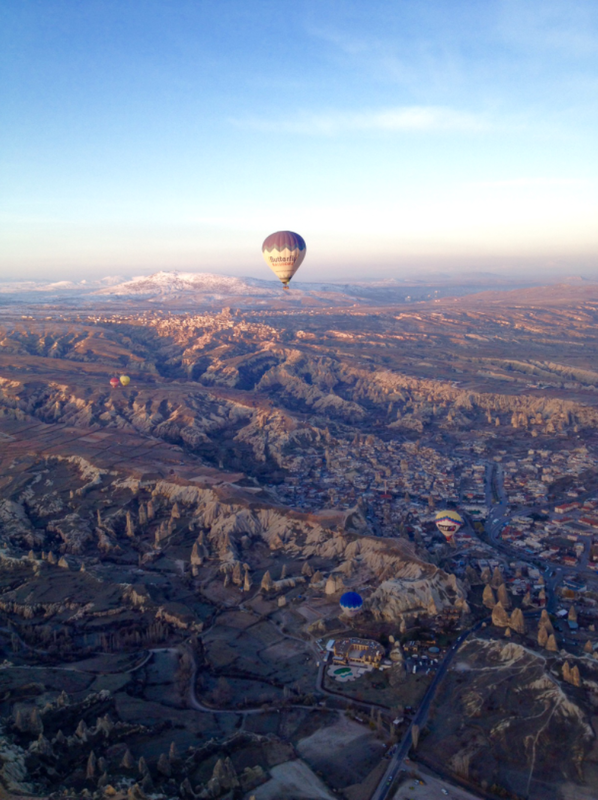 Urgently, our balloon pilot, Mustafa, beckons us to climb in, and we begin our adventure. The sun begins to club above the horizon at the same moment as we do…. 3 balloons, 18 Rick Steve’s guides and the sun. This day was going to be very special. Mustafa gave my colleagues and I, in balloon number 2, some brief safety instructions as our ‘Butterfly’ balloon kissed its twin on the way up. Slowly, however, the 3 aircraft began to drift freely over the rugged but intriguing plateau, beneath. 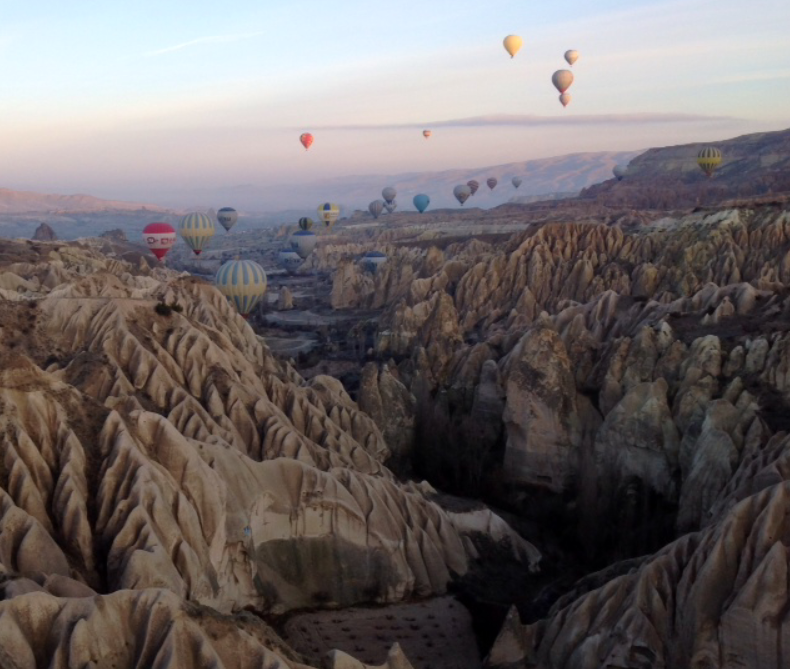 Within minutes we realized that clusters of balloons were rising from all over the region, like love bugs in the summer rising towards the sun. In my basket, Toni, Nina, Sarah, Mert, Cary, Virginie and Etelke looked at each other with that look that humans share when they experience the unimaginable…. It was amazing! For the next hour we flew, constantly pointing and chatting excitedly. But it was peaceful. The sky was clear and we could see Mt. Argeus in the distance. The cave dwellings and villages littered the ground beneath us, and momentarily we saw a white tailed fox dash into one of the rock crevices. There was so much that could be seen and just too little that could be taken in. Personally, I felt very small and yet very special to be able to enjoy what we all enjoyed together. The balloon trip ended all too quickly. One hour and 15 minutes in the sky. We had a glass of champagne when we landed and then drove back to our beautiful Cappadocian hotel, just in time to enjoy a second breakfast. 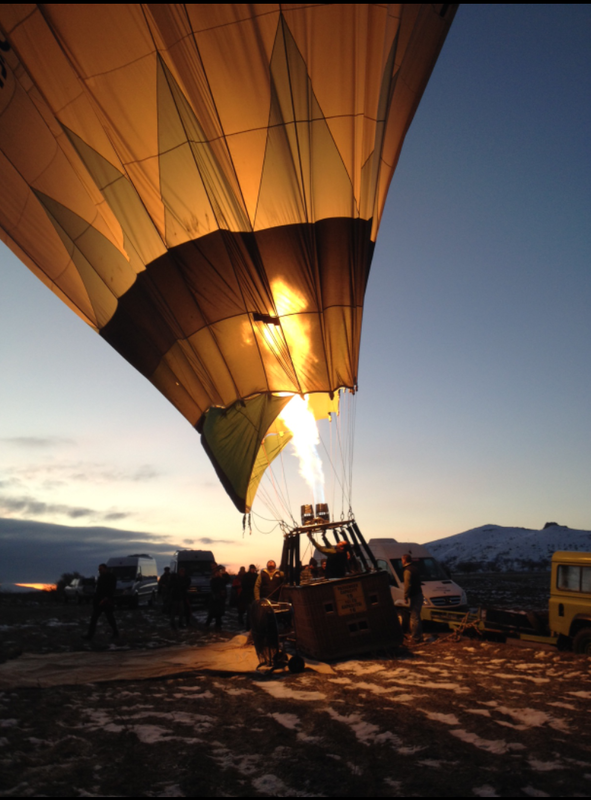 Following lines were written by Virginie More, about the hot air balloon ride. After having lived ten years between Los Angeles, Montana, and Florida, Virginie has finally settled back in Lyon, France, with her husband Olivier. She is originally from Brittany, one of the chapters she researched for this guidebook. When she is not teaching Americans about her culture while leading Rick Steves’ tours, she can be found instructing scuba diving in the Caribbean. Waking up at 4:30 am can lead to WOW moments! 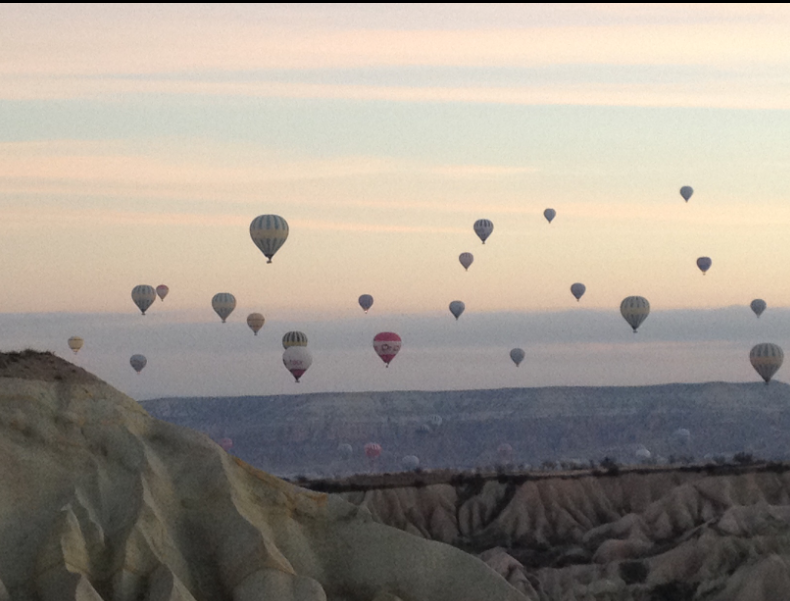 Most of us (18 guides) woke up early for this optional hot air balloon ride over the Cappadocian landscape. For most of us, it was the first time in a balloon. The magical landscape of fairy chimneys, deep gorges, and layered pink and red rocks made this first experience unforgettable, definitely a WOW moment for me! The Butterfly company was very well-organized and professional, those who had some fears about this “flight” were quickly reassured. After an hour in the air and a safe landing, we all toasted our great pilots with bubbles, and we were already talking about our next ballon ride! Photo by Virgine More. 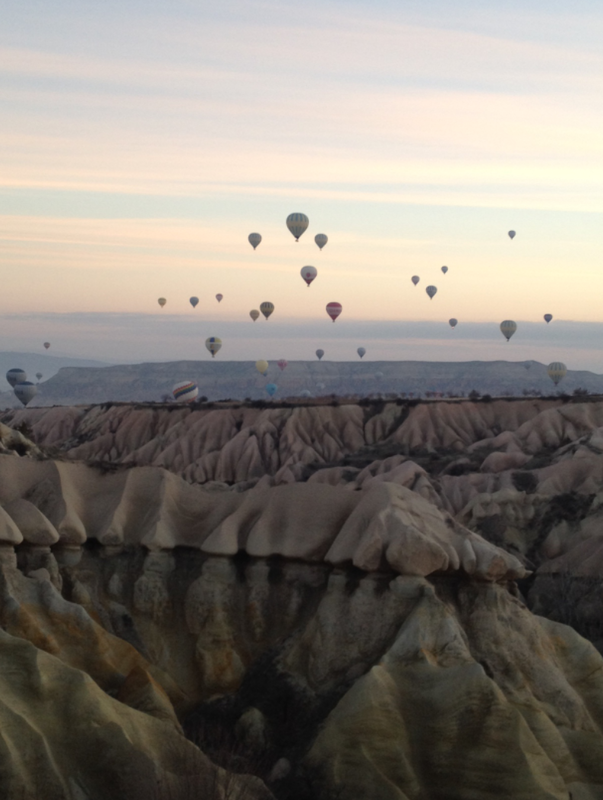 Potpourri of hot air balloons floating over Cappadocia.